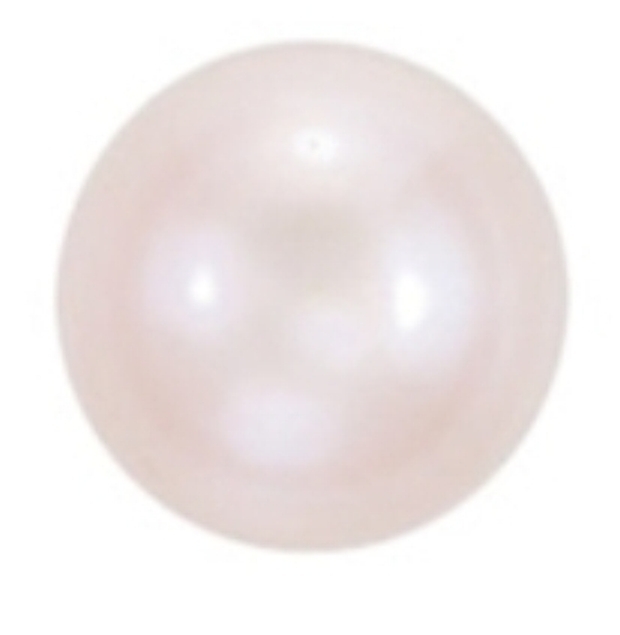 The British Auction House Woolley & Wallis has announced the sale of an extremely rare, natural, near-spherical, nacreous, saltwater pearl at its Jewelry Auctions coming up at its Salisbury Salerooms on May 1st, 2014. The pearl with a shortest and longest diameter of 16.51 mm and 17.44 mm respectively, has a weight of 33.147 carats, equivalent to 132.59 grains. The pearl is without any doubt the largest, natural, near-spherical, saltwater, nacreous pearl to appear at a public auction, and perhaps one of the largest spherical/near-spherical saltwater pearls in existence. The largest near-spherical, nacreous pearl to appear at an auction is the unnamed 60.36-carat (241.44 grains), natural nacreous pearl that appeared at Christie’s Contemporary Jewelry & Watches Sale 7664 at Dubai on April 29, 2008, and sold for a whopping US$713,000. However, this pearl was a freshwater pearl and not a saltwater pearl as the pearl appearing at the Wooley & Wallis auctions. The largest perfectly spherical, saltwater, nacreous pearl in existence is the 60.94-carat (243.76 grains) Paspaley Pearl. But, this perfectly spherical pearl is a cultured pearl and not a natural pearl. Other spherical natural salwater pearls whose existence have been recorded and described in “The Book Of The Pearl” by George Frederick Kunz, first published in 1908, are the 28.44-carat (113.75-grain) and (28.32-carat) 113.25 grain “Bapst Pearls;” the 27.88-carat (111.52 grains) La Pelegrina-2 pearl; the 27.5-carat (110 grains) La Reine De Pearls and the 26-carat (104 grains) Oviedo Pearls. However, the present whereabouts of these historic pearls are not known. 1) A round pearl of great perfection, but a little flat on one side (near-spherical), weighing 49 carats (196 grains) sent as a gift by Shah Abbas II, the King of Persia, to the great Mughal Emperor Aurangzeb. 2) A perfectly spherical white pearl, perfect in every respect, with excellent luster, orient, surface quality and overtones, weighing 32 carats (128 grains). 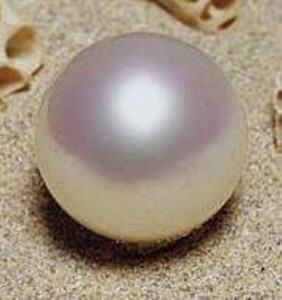 According to Tavernier, this pearl was the only jewel purchased by Emperor Aurangzeb. 3) A spherical pearl of perfect form, whose sketch was indicated as Fig 5, in Tavernier’s book, Le Six Voyages de J. B. Tavernier- The Six Voyages of J. B. Tavernier, published in 1676, and whose weight was estimated by G.F.Kunz to be around 110 grains. According to Tavernier, this pearl was the largest perfectly spherical pearl he had ever seen. He further stated that a matching pearl for it was never found, and for that reason it was kept with the unmounted jewels. The present whereabouts of the above historic pearls mentioned by Jean Baptiste Tavernier are not known. Two contemporary spherical pearls whose whereabouts are known are the Abernathy pearl and the Black Beauty pearl. The “Abernathy Pearl” however, is a white, freshwater nacreous pearl weighing 11 carats (44 grains) and the “Black Beauty” is a black saltwater nacreous pearl weighing only 6.53 carats (26.12 grains). The above statistics clearly bring out the fact about the extreme scarcity of perfectly spherical pearls, be it saltwater or freshwater. To find a natural pearl, whatever be its shape, is an extreme rarity. This fact coupled with the observation that most natural pearls are usually baroque/irregular in shape, shows that the occurrence of a regular shaped large pearl such as spherical or near-spherical is an extremely rare event in nature. This explains the staggering prices fetched by such pearls whenever one of them hits the auction block, such as US$713,000 fetched by the 60.36-carat, natural, near-spherical, freshwater pearl that appeared at Christie’s sale in Dubai, on April 29, 2008; and the staggering £1.6 million fetched by a matching pair of drop-shaped pearls weighing 34.51 carats and 33.24 carats at a Woolley & Wallis auction on April 26, 2012. 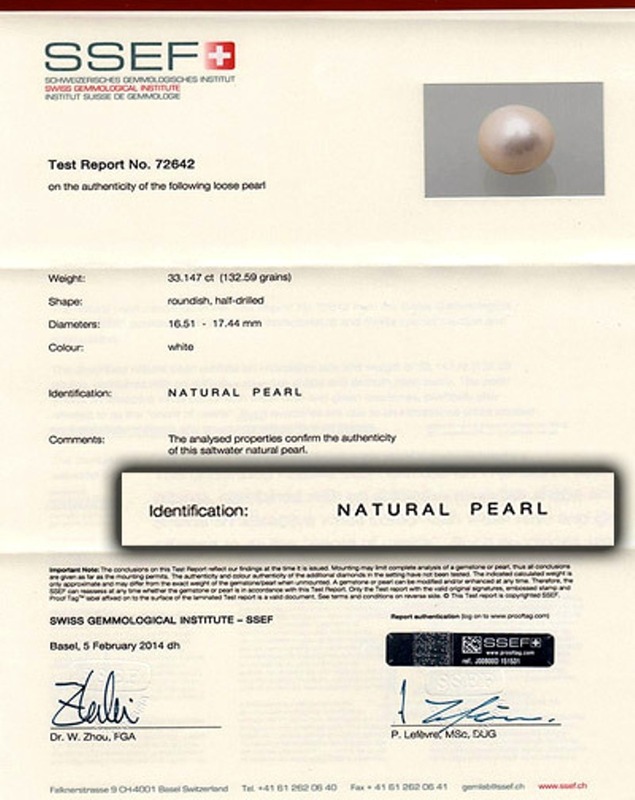 The pearl is accompanied by two lab reports, one bearing number 09623 from The Gem and Pearl Laboratory of London, dated 21st January 2014 stating that the pearl measures 16.5 – 17.4mm, weighs 33.15cts and is a natural saltwater pearl. The natural pearl described in Test Report No 72642 from the Swiss Gemmological Institute SSEF possesses extraordinary characteristics and merits a special mention and appreciation. The described natural pearl exhibits an impressive size and weight of 33.147cts (132.59 grains), combined with an attractive roundish shape and smooth pearl lustre. The pearl shows an attractive white colour with weak rosé and green overtones, poetically also referred to as the ‘orient of pearls’. Such overtones are due to an iridescence effect caused on the surface of pearls and greatly contribute to their beauty. The combination of well-balanced trace elements found in this pearl is characteristic for a saltwater pearl. A natural pearl of such a large size and quality is very rare and exceptional. Wooly & Wallis have placed a moderate estimate of US$200,000-400,000 on this extremely rare natural, saltwater, near-spherical, white, nacreous pearl. However, going by the performance of such natural pearls at public auctions, it will not be surprising if there is a repetition of the performance of the Woolley & Wallis April 26, 2012 auction of the matching pair of drop-shaped natural pearls, and the pearl registering a price of over a million US dollars.